Weibo is China’s version of Twitter, except that it’s better managed and more profitable. This year, revenues and profits are expected to grow by more than 50% year-over-year; it’s a great business, with a long runway of growth ahead of it. 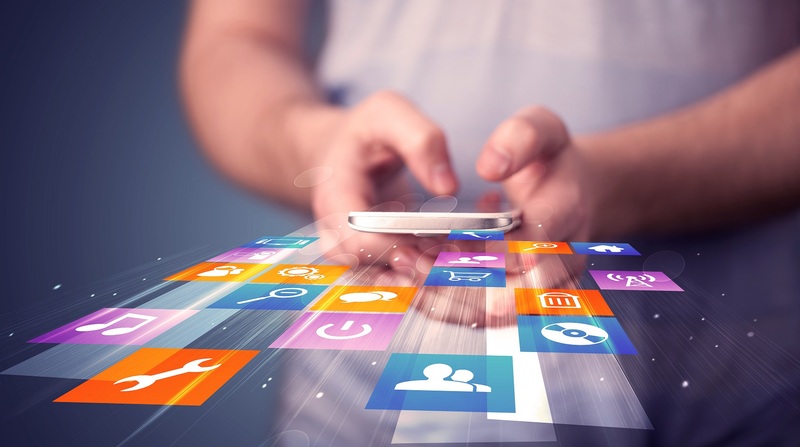 Best of all, we have found a way to invest in Weibo at a 2019 EBIT multiple of less than 6x by purchasing shares of SINA Corporation. SINA Corporation (“SINA”) is a Chinese technology company founded in 1998 as a web portal. Today, it is best-known for its investment in Weibo, which is one of China’s largest social networks. Weibo’s business model is very similar to that of Twitter; money is made by placing ads and promoting feeds. Compared to Twitter, Weibo has 20%+ more monthly active users, those users spend more time on the platform per day, and Weibo is considerably more profitable. 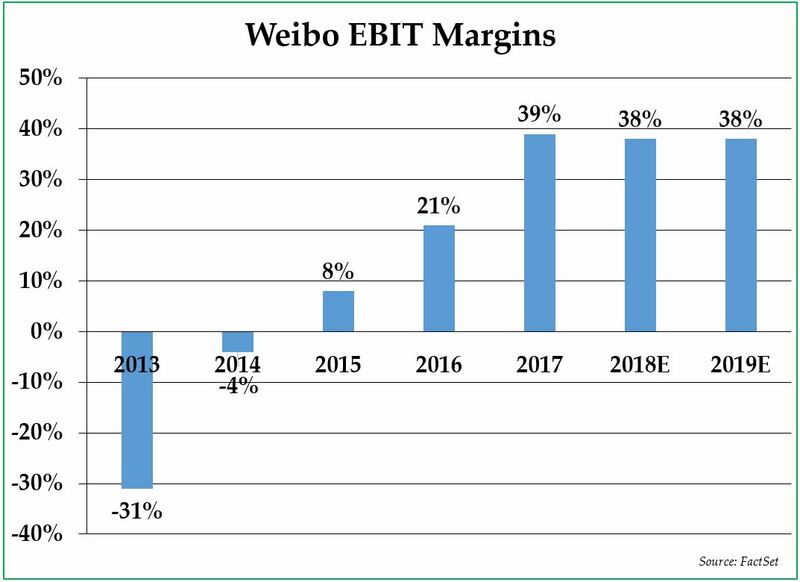 As a result, Weibo’s EBIT margins are currently between 35% and 40%, whereas Twitter, in comparison, is barely profitable. The Weibo background is critical to understand because SINA Corporation owns a 46% stake in Weibo and is also the controlling shareholder in Weibo with 72% of all Weibo votes. While many investors who like Weibo’s business might choose to invest directly in Weibo shares, it seems to be a far more compelling proposition to invest in shares of SINA. Thus far, emerging market stocks are in a bear market in 2018, and some investors would argue that emerging market stocks are currently a great buy. Both SINA and Weibo saw their stock prices plummet by 50% or more since their recent highs on U.S.-China trade war talk and the unexpected rise of Douyin, a Snapchat-like short-video platform that was launched in late-2016 and that has already reached 500 million monthly users. The market seems to believe that Douyin’s massive early growth has come at Weibo’s expense. However, thus far, Weibo’s operating metrics have barely been influenced by the rise of Douyin; monthly users, daily users, and time spent share all continue to increase. Users appear to be using Weibo and Douyin for fundamentally different reasons, and it seems unlikely that Douyin will take market share from Weibo’s microblogging territory. 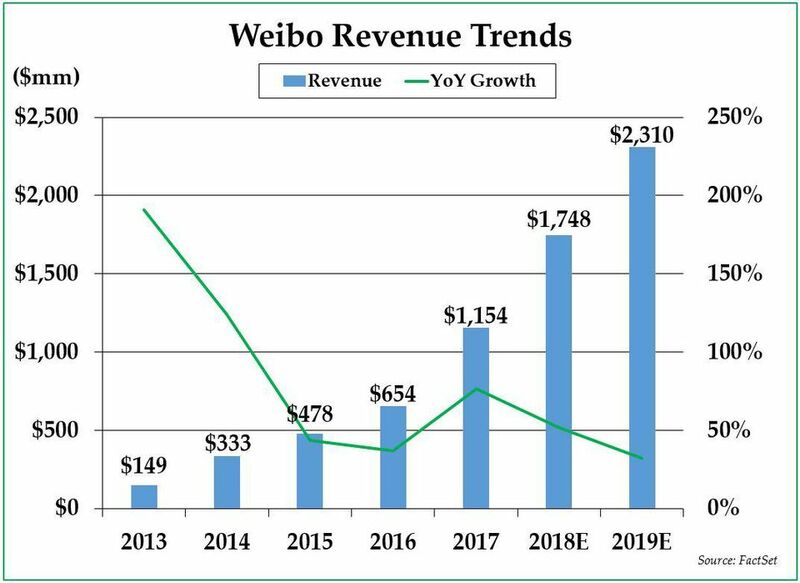 As a result of this considerable drop in price, Weibo is now trading at approximately 12.0x consensus FY2019 EBIT, which represents excellent value for a fast-growing, highly profitable business. That said, SINA’s shares represent an even more exciting investment opportunity. SINA’s market cap currently stands at $4.4 billion. Of this, $1.8 billion is attributable to cash and investments not related to Weibo. Therefore, the market values SINA’s 46% stake in Weibo at $2.7 billion, even though Weibo’s current market cap is $12.7 billion. While Weibo is likely undervalued, SINA’s stake in Weibo seems significantly undervalued. At the $2.7 billion value which Mr. Market ascribes to SINA’s stake in Weibo, investors are effectively buying shares of Weibo, through SINA, at a multiple of just 5.9x consensus FY 2019 EBIT. Moreover, SINA’s stake in Weibo deserves a premium because SINA owns Class B shares of Weibo, each of which has three votes, compared to only one vote per every publicly-traded Class A share. Should the valuation gap between SINA and Weibo ever close, SINA’s share price should appreciate considerably, even if Weibo never recovers from the recent investor panic. 2. Should Weibo get its growth-company multiple back and/or reach the median sell-side target price, SINA shareholders should be handsomely rewarded through its investment in Weibo. Should neither happen, it seems likely that SINA management would buy back shares until the valuation gap disappeared. Importantly, SINA’s CEO owns $500 million worth of SINA stock and has a track record of sound capital allocation and returning capital to shareholders. SINA repurchased $303 million of stock as part of a buyback program that expired in June 2018, which translated into a 5% reduction in shares outstanding at an average price of $89 per share. Given the valuation gap between SINA shares and Weibo shares, it seems likely that SINA will continue to repurchase shares at prices which should be accretive to SINA’s intrinsic value. Given the 50% decline that SINA shares have already experienced, this is not a risk-free investment. Like many Chinese tech companies, SINA Corporation and Weibo are structured as variable interest entities to allow SINA and Weibo to raise capital in foreign markets. Investors in SINA are taking on business risk, technology risk, currency risk, and country risk. Given the attractive valuation of SINA shares, we believe Weibo’s risks have already been discounted. The 2018 emerging market bargain hunt has begun, and I don’t know how long it will last. It’s worth taking a look at SINA Corporation, and, while you’re at it, it’s worth taking a look at SK Telecom too. The views expressed are those of the author as of the date of publication of this report, and are subject to change at any time due to changes in market or economic conditions. This information is prepared for informational purposes only and is not intended as an offer or solicitation for the purchase or sale of any security. The comments should not be construed as a recommendation of individual holdings or market sectors. There is no guarantee that the type of investments discussed herein will outperform any other investment strategy in the future.